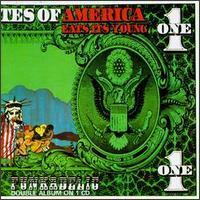 America Eats Its Young is the fourth album (a double album) by Funkadelic, released in 1972. This was the first album to include the whole of the House Guests, including Bootsy Collins, Catfish Collins, Chicken Gunnels, Rob McCollough and Kash Waddy. It also features the Plainfield based band U.S.(United Soul), which consisted of guitarist Garry Shider and bassist Cordell Mosson, on most of the tracks. Unlike previous Funkadelic albums, America Eats Its Young was recorded in Toronto, Canada, and in the UK. The original vinyl version contained a poster illustrated by Cathy Abel. The bottom of the poster features the first widespread appearance of the Funkadelic logo, which would later appear on the cover of the album Standing On The Verge Of Getting It On.